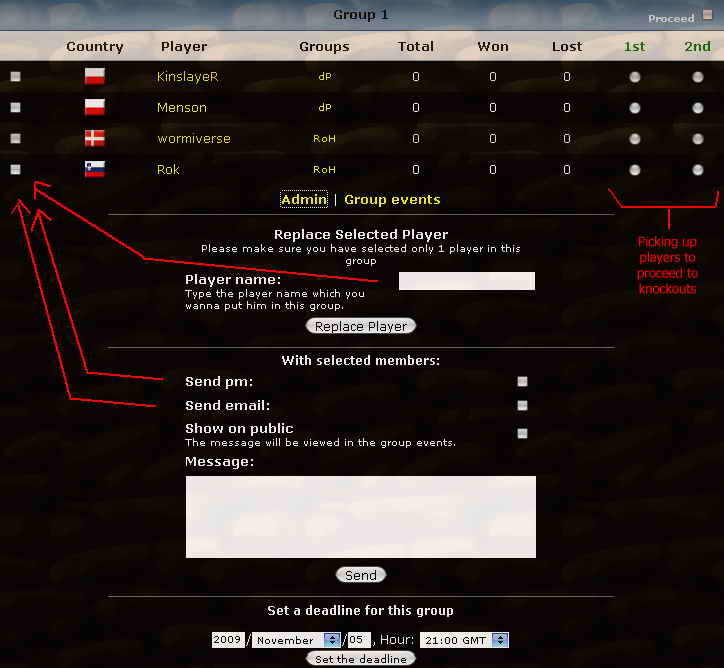 Read about how our cups or tournaments work. I coded this part with my little experience I had with cups from before. 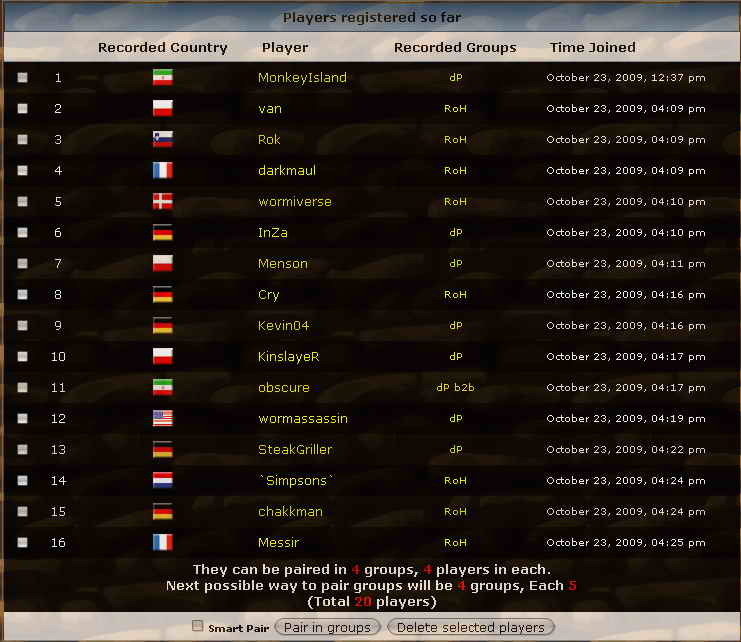 As you know cups in this community mostly were 'forum-base' and a lot of times the cup would get messy cause of people not being around to play their games and of course handling forum base cups is a lot of trouble. So here are TUS Cups!! This is exactly the cup that you know from the past. A public cup is open to all people. Everybody can join this cup and play. In the cups recent page, You see type of cups with an 'Unlock' image next to their name. 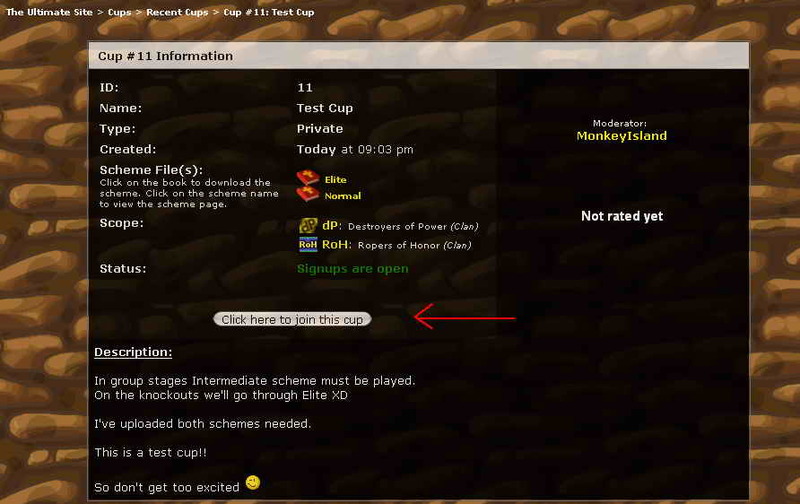 An example of public cup is the elite (or hysteria) cup we previously had on our forum. Not everybody can host a public cups, Because handling them is so hard. You sure can ask for one. But we are not planning to host many public cups at once since they'll get totally out of hand. There can be only 10 public cups open at any time - if more cups have been requested, they must wait their turn. Ok, As the name says, Not everybody can join this cups. It's probably the most important thing about TUS Cups. The history goes back, darkmaul told me about clans inner league. We all have seen clans getting more inactive (and dying). So I thought about giving clans some more activity by inner cup. 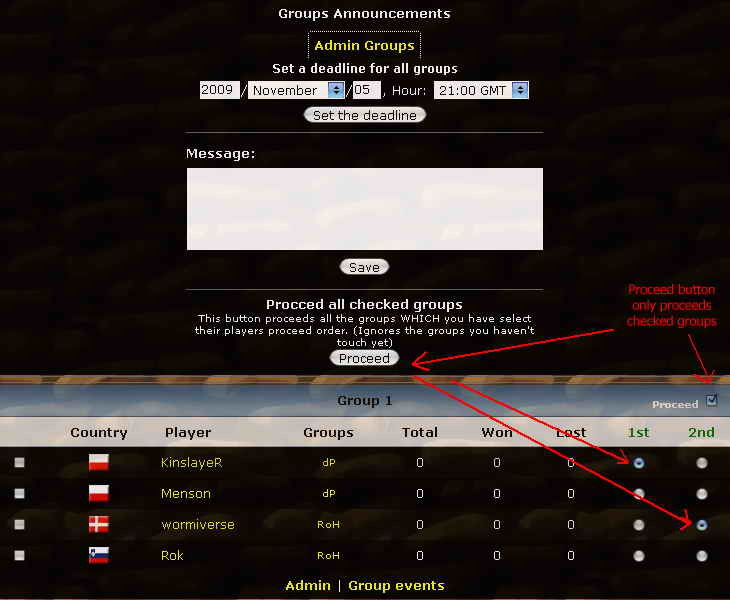 But Private Cups went more than that and now it is possible to host private cups between variation of group, Even combined. Any number of combinations, Between any groups. Groups are defined: Clans, Communities and Countries. Anybody can host a private cup. There's a 'lock' image next to their name in the cups recent page. The minimum number of players to play a cup is 6 (2 groups, 3 players in each) and the max is 80 (16 groups, 5 people in each), Though max number can be easily increased. * Although hosting cups need no rights, But all created cups needs to be approved first. Just to be so clear, I'll create a cup as test to show you how things are supposed to work. Type a name for your cup. It works best to set something meaningful. You can set as many schemes you want. There's an autocomplete running there. You can type the scheme name or scheme ID on TUS, And you get to select the schemes. In this case, Scheme 10 is Rafka's Normal NNN luckless scheme and 7 is Ray's Elite scheme. Your scheme must be on TUS. There are already many standard schemes on TUS, So if you are planning to host a popular scheme you can select it there. If you need to pick very specific scheme for it, Then you have to create your scheme on TUS first. Here's the Guide on how to save scheme on TUS. This is the place where you set specific groups for your private cup. 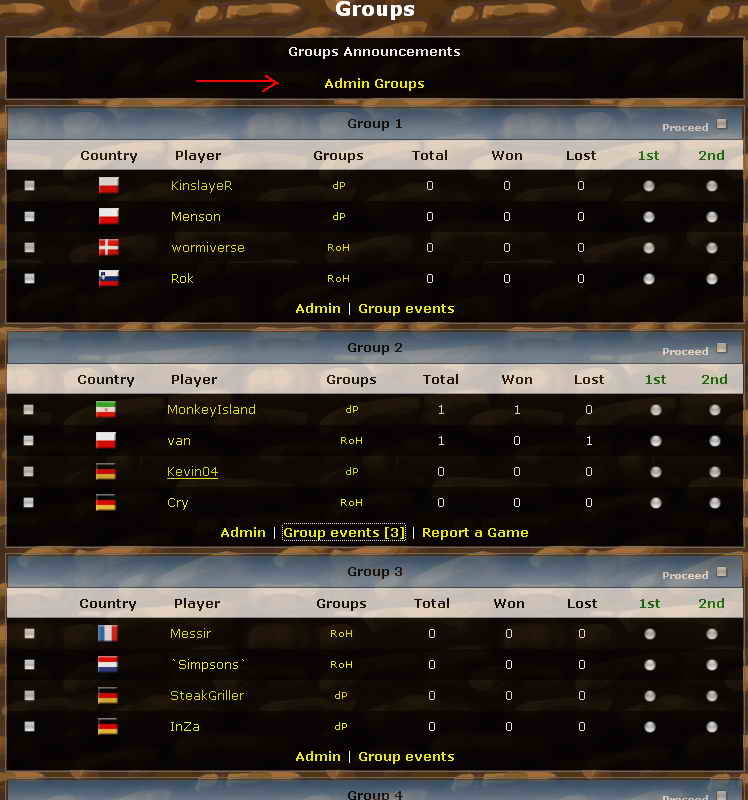 Select whether you want to choose clan or community OR you want to pick a country. Click on 'Add more groups' to add more!! In my example, I picked 2 clans: dP and RoH. Imagine you wanna make a cup between some of your friend, Who do not share any group. No same clans or communities and country. That's where cup password kicks in You set a password for the cup, And give the password to your friends. When entering the cup, system asks for password. Note that you can both set password and set scope. In this situation, The people who are in the specified groups do not need to enter password, and people who are not in any groups, Will have to input password. I guess it is a good practice to always set a password. Because maybe you need only 1 guy to complete your cup and there isn't anyone left in the specified groups. So you can give the join password to a friend to fill the last one. No? Ok don't set any password. Note: If you set a scope or password for your cup, You are creating a private cup. You can set your cup sign ups date in the future, Not stright away. Why? Some cups takes much time to get filled with people. Many times some of the people who join your cup at first, Gets bored of waiting and quit worms!! You can set the time a bit in the future so that you can advertise your cup and when sign ups are open, Many people join at once and you start your cup faster. No? Ok, Set it straight away. If you wanna host a public cup, Then do not touch the password or the scope part. Check this box to tell us you wanna host a public cup. Do you really think you can handle many of people? Not an easy job. Remember we rate cup mods!! Write some explanation for your cup. Welcome people to your cup! Explain your cup and how you want it to be. Any specific rules? write them here. How you want different schemes to be handled in different parts of the cup? Write all here! Ok, You are done!! click on the create, if you had some errors, System will tell you. otherwise you'll see your cup in the 'recent cups' page. Congratulations!! 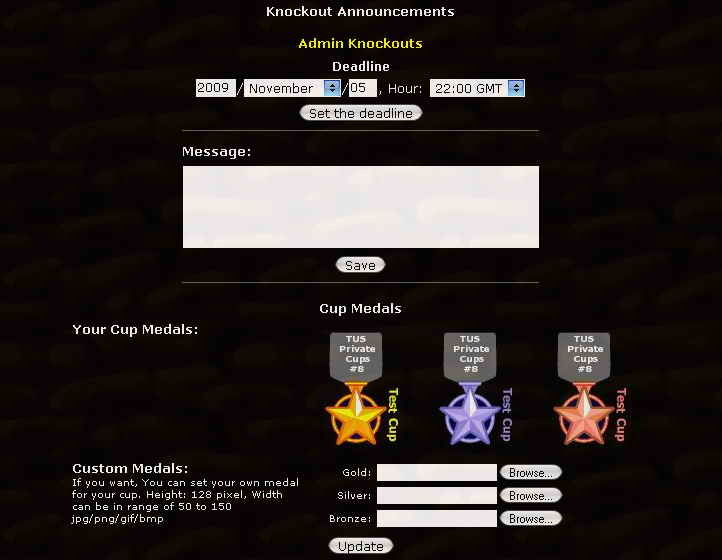 In the cups recent page, You will see the list of all cups being hosted. Next to the cup names, There's this lock image that can be locked or unlocked. By clicking on the join button, You join the cup and you will see your name in the 'Players registered so far' Table. Now you gotta wait till enough players join the cup. To report a game in a cup, Simply enter that cup's page. As you can see, The bottom of this table announce that how you can pair the players and if it is possible to pair them or not. Minimum required people to start your cup is 6: 2 groups, 3 people in each. Maximum is 80 people: 16 groups, 5 people in each. There's a checkbox next ot each players name, In case you needed to delete them. If it is possible to pair people, You will see the 'Pair in groups' button. By hitting 'Pair in groups', System will randomly pair people in the groups. Do you remember when joining a tourney with your clan mates, And you were afraid that same people from your clan get paired together? Smart pair tries his best to avoid people from same clan, community or country fall into same group. If there are even number of clans, communities or countries, Then 'Smart Pair' do its job so sharp. For example, In this test cup (image above), There are 8 dPs and 8 RoHs, So if I check Smart Pair, We will have 4 groups, 2 dPs and 2 RoHs in each. But you gotta cut Smart Pair some slack, If there are 12 RoHs and 4 dPs, Smart Pair can't do magic ok? Ok now that the groups have been paired, what's the first thing you must do? Of course. You gotta set a deadline for people to get their games done!! 1. Set a deadline for group. When set a countdown counter will be set. 2. Message, If you have anything special to say, You can save it here, It will display it under the deadline. 3. The proceed button. This button will proceed selected groups to knockouts. I'll get into it a bit later. Everytime you set a deadline, System will update previous one with the new. so don't worry if you set it wrong. Same goes for the message to announce. - Opps gotta go vacation! Well we're sorry that they can't participate anymore, But its ok, You have one last chance to replace them with other people. Just remember the guy you're replacing shouldn't have played any games in that group. 2. With this tool, You can send pm, Email to the selected people in that group. Asking/pushing them to play their games. "I dropped Rok and Menson from the group due to inactivity, Kinslayer and wormiverse were around..."
Note that if you wanna say something on public you don't need to select any member of the group. 3. Deadline for the group. yea i know we already have a deadline for all the groups. But this one acts exactly the same but it is only for that group. I had seen in past that mods had to put different deadlines for some groups due to their reasonble excuses. So while you set a time for others to play their game, You can act differently for each group. On the right of the group box, You have these 2 columns labeled: '1st' and '2nd'. Simply select the 1st and 2nd player of this group. You can pick one at a time too. 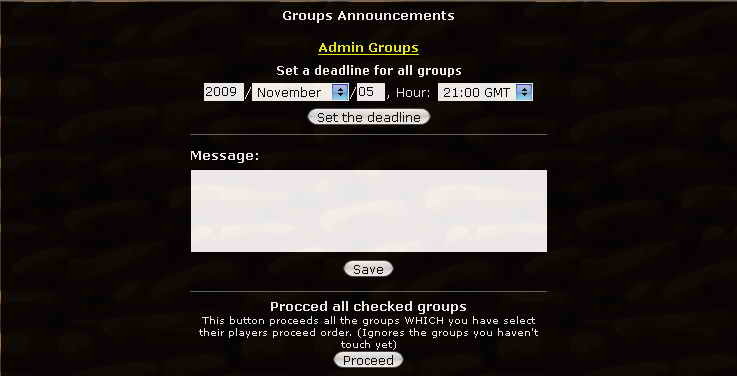 Then click on the 'proceed' button on the 'Admin Groups' link on top. remember I said we'll get into that! As you can see there's a proceed button under each box. Simply select the player and click on proceed to proceed the player into the next level. 3 Thing to set here also. First 2 are deadline and inform message, Which will act exactly the same as before. The third part is setting up your custom medals. If you think TUS Cups default medals are ugly. It's ok, Set your own medal. Your custom medals height must be 128 pixels and width can be from 50 pixel to 150 pixels. If you proceed people who are in final and bronze match, System will give medals to the players, Give points for the medals, And finally it will close your cup! Each win give the winner 5 points and takes 5 points from loser points. If you want to specify your winner by bo3 or bo5 or any other pattern, And you need each game of those to be counted individually, Then ask your cup members to report each game individually. System will give each win 5 points. If you want to specify your winner by bo3 or bo5 or any other pattern, And you only need to know the result of those games, Then ask your cup members to report with multiple replays at once. System will give 5 points only. Gold, Silver, Bronze medal in the cups with less than 8 groups will give: 20, 15, 10 points. Gold, Silver, Bronze medal in the cups with 8 or more groups will give: 40, 30, 20 points. Highest percentage in more than 1 cup: van, 100% (20 games), 18 other players with 100%. Highest percentage in more than 1 cup: DarkOne, 100% (14 games), 20 other players with 100%. 33 players signed up without finishing a single game. Highest percentage in more than 1 cup: DarkOne, 100% (17 games), 23 other players with 100%. 35 players signed up without finishing a single game. Highest percentage in more than 1 cup: Joschi, 100% (20 games), 23 other players with 100%. 36 players signed up without finishing a single game. Highest percentage in more than 1 cup: DarkOne, 100% (22 games), 17 other players with 100%. 37 players signed up without finishing a single game. Highest percentage in more than 1 cup: DarkOne, 100% (23 games), 19 other players with 100%. Highest percentage in more than 1 cup: DarkOne, 100% (29 games), 36 other players with 100%. 40 players signed up without finishing a single game. Highest percentage in more than 1 cup: DarkOne, 100% (29 games), 31 other players with 100%. 47 players signed up without finishing a single game. Highest percentage in more than 1 cup: DarkOne, 100% (37 games), 32 other players with 100%. 53 players signed up without finishing a single game. Highest percentage in more than 1 cup: DarkOne, 100% (56 games), 42 other players with 100%. 56 players signed up without finishing a single game. If playoffs were needed for the group phases, then those playoff games were added as well. Unfinished rounds have not yet been processed, since it'll complicate keeping track. Some cups also took much longer to be completed than others and I didn't feel the need to include that. I'm uploading this here so that future cup moderators can use this to remove people from cups who have a history of non-activity. I'm a firm believer in second chances, but if there's been little activity from your part in previous cups, then chances are high the same is true for future cups. Please note that someone who has played 75% of his/her games is still more active in cups than the average player. It seems like some people have confused the concept of tournaments with the way cups work. I'll try to explain the tournaments. Like any other tournament you have seen on WN, TUS tournaments works the same. It means that when a time for a tournament is set, people gather at that time in a specific channel, and play their games. You don't have to find your opponent to play your games, because everybody is in channel at the time of the tournament. 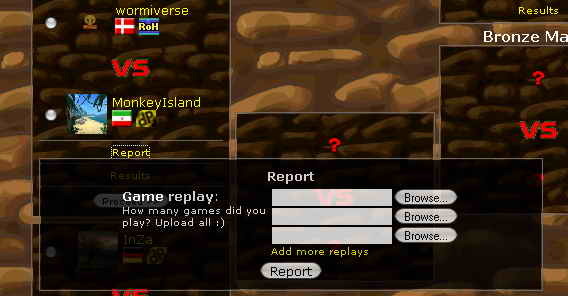 Now in most of the tournaments other than TUS, there's a mod in channel which players will pm their name to. The mod gather the names, pair them with a pairing tool program and then announces the pairs in the channel. No one will bug the mod to ask him questions like "Players list?" or "Am I in? did you get my pm?" because everything is getting recorded in the tournament page on TUS. 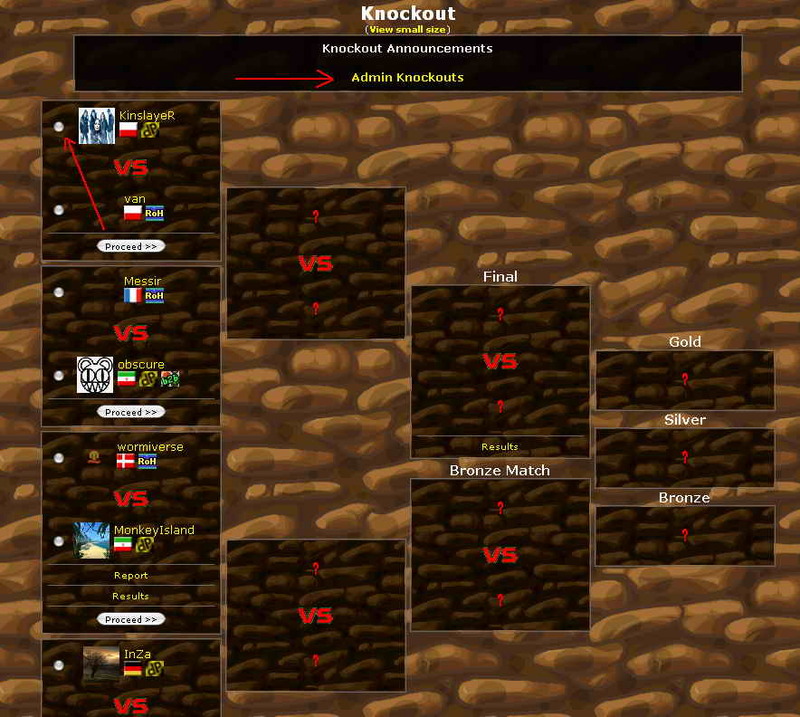 So the only thing mod does at this stage is to announce that tournament url in the channel. No one will get faked because you need to be signed in on TUS to be able to join the tournament. Players can clearly see their way through the tournament. Mods can't cheat with pairings. TUS pairing system is automatically doing the job. Replays doesn't get lost. Because you report them right after the game. At this stage the mod's job is to proceed players to the next round or deal with their possible complaints.